Your odyssey begins with a flight to Tel Aviv. Arrival at Ben Gurion Airport, where you will be met by an IBMT Tours member and transferred to your hotel. Overnight in Tel Aviv. We drive up the coast to Caesarea, and the seaside vista sparkles, Caesarea was the Roman capital with many ancient ruins and archaeological digs to visit. High up on the list of sites to see is a Roman aqueduct and theatre that held prominence during this era. The next stop you will make is at Muhraka – this is the place where Elijah and the Prophets of Baal had a confrontation that reverberated for many years. You will be attracted to the fantastic views on Jezreel Valley and lower Galilee while you are in the area and it affords plenty memory-making photo opportunities for travelers. Megiddo is the site where Armageddon took place and the battlefield is on display that presents a traveler an excellent chance to learn of the history of the area. Next stop on day is Acre, see the underground Crusader City, and crypt housed in the city. The old city is recognized UNESCO World Heritage Site and your day ends with a trip to a local market and the harbour. You will spend the night at another four-star at the Kibbutz Lavi, where magnificent dinner will be served. 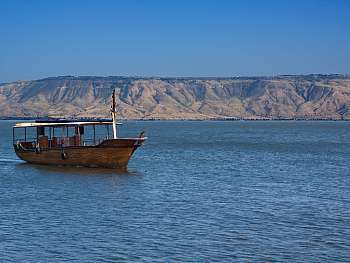 Day four is another day with plenty of activities that start with a quick tour of Tiberias that leads into a boat tour of the Sea of Galilee. The Yigal Alon Centre is waiting for you after your boat tour, an ancient fishing boat from the first century is displayed there and it called the ‘Jesus Boat.’ In Capernaum, you will be taken to a second-century synagogue, next is the site of the miracle of fish and loaves at Tabgha. The Church of the Multiplication was built in the fourth century and has the most amazing mosaic floor that will take your breath away. For the religious traveler, the Mount of the Beatitudes will hold significant importance; it is where Christ delivered the Sermon on the Mount, a message that resonated with his disciples for centuries. Once you have seen those sites, a trip to the Golan Heights will be the last stop where you will access the area through the Banias Springs. You will spend another night at your four-star hotel Kibbutz Lavi with another fantastic dinner awaiting for our group. Day five will be another day that will keep the traveler busy – first up is the Wedding Church in Cana, where Christ performed his first miracle turning water into wine. More religiously focused travel stops continue with our arrival in Nazareth. 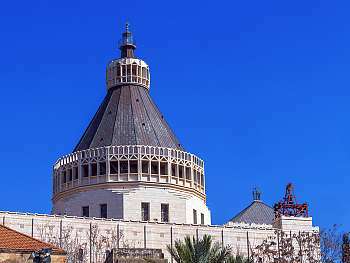 The Church of the Annunciation, St Joseph’s carpentry workshop, and The Spring of the Virgin Mary will see our tour group spend quality time at. The spring has been identified as the place where the Angel Gabriel revealed himself to the Virgin Mary and told her she would bear the Son of God. A stop on the road at Yardenit is a place of importance as it was a place where many baptisms were conducted for the followers of Christ on the Jordan River. The ruins and the archaeological dig at Beit Shean is one of the most impressive reflections of Roman and Byzantine culture that Israel has to offer. In the evening, we have a boat tour of the Jordan River waiting for our group; it will pass Jericho and dock at the ‘Golden City of Jerusalem.’ A great meal at another excellent hotel in Jerusalem caps a great day of activities. A spectacular day waits as we tour ‘The Golden City,’ and our focus is on the Old City where we start the tour at Mount of Olives. It provides a panoramic view of the Old City and an ancient Jewish cemetery outside the walls of the Old City. The wonders of the Old City are many, and we will take to all of them during your stay in Jerusalem – churches will be the focal point of this part of the day. The Church of All Nations, also known as the Basilica of Agony is the first stop. Next, is a Roman Catholic Church on the Mount of Olives next to the Garden of Gethsemane. Before his arrest – the apostles relate that Christ went to the garden to pray, as he knew he would be crucified – and asked for forgiveness for those who played a role in his death. It isn’t often that you can visit a street that was the main street of a city 2000 years ago, but a walk along Cardo will show you the tapestry of the city in those days. Once you have made your way down the Cardo, Temple Mount is the next place to visit with the Western Wall in close proximity if you wanted to say a prayer. Walk in Christ’s path when you travel down the Via Dolorosa – he was led down this street with the cross on the way to Mount Calvary – after your spiritual walk in Christ’s sandals, the Church of the Holy Sepulchre stands as a testament to the history of the Old City. For the shopper and the haggler in you, test your skills to drive a bargain at the Arab Bazaar – everything under the sun and then some is for sale and the price is always negotiable. The last stop of the day is one many Christians hold dear – the Garden Tomb. Many Christians believe this is where Christ was laid to rest when he was taken from the cross and they also believe is the tomb where Christ’s resurrection took place three days hence. Capping our day is feast at our exquisite hotel.Today we visit the Old City of Jerusalem. Our appreciation of this Golden City begins with a panoramic view from the Mount of Olives, overlooking the walls of the old city and the ancient Jewish cemetery. Enter the Old City to begin exploring the wonders of Jerusalem. 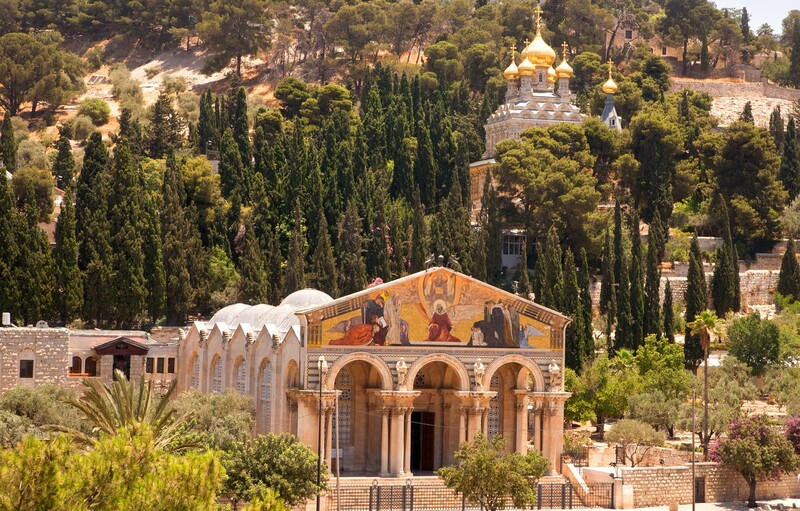 Visit the Church of all Nations, which is also known as the Church or Basilica of the Agony, a Roman Catholic church located on the Mount of Olives in Jerusalem, next to the Garden of Gethsemane. It enshrines a section of bedrock where Jesus is said to have prayed before his arrest. Walk through the Cardo, the main street of Jerusalem 2000 years ago. View the Temple Mount and the Western Wall. Take a spiritual walk along the Via Dolorosa, where Jesus carried His Cross, continue to the Church of the Holy Sepulchre. No visit to Jerusalem is complete without a exploring the colorful Arab bazaar (a chance to test your negotiating skills). Visit the Garden Tomb that is considered by some Christians to be the site of the burial and resurrection of Jesus. Dinner & Overnight in Jerusalem. The day begins with a visit of an ancient old world model of Jerusalem; from there we proceed to Yad Vashem, Israel’s official World Holocaust Remembrance Centre. 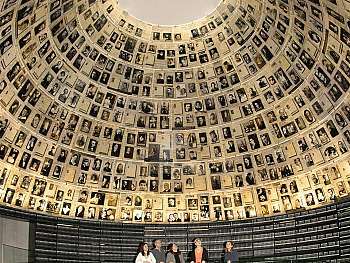 The centre was established in 1953 and stands as a memorial to all the Jews who were murdered by Nazis in WW II. To enter the centre, you will walk down the Street of Righteous Gentiles. The street was named as such to honour the non-Jews that risked their lives to save their Jewish friends and neighbours during the WWII. In Ein Karem, you see the place where John the Baptist was born and from there you will make your way to Mary’s Well, where the Virgin Mary met her cousin Elizabeth. Our day ends with our arrival in Bethlehem and a visit to the Church of the Nativity. The Roman Emperor, Constantine, and his mother Helena commissioned that the church was to be built in 327 AD. It has long been said that the church was built over top of a cave where Christ was born and Constantine’s conversion to Christ was the impetus that built the church. After the stop on Nazareth, we will return to our charming hotel in Jerusalem for another dinner that will overwhelm your senses. Our day begins with a visit to Qumran, for those who don’t know what the significance of this site is; it is the place where a Bedouin boy found the Dead Sea Scrolls in 1947 in cave that we will visit. The city has a long history that dates back over a millennium or two and it sits on the shore of the Dead Sea. The Dead Sea is the lowest point on Earth – 400 meters below sea level – and is a Salt Lake has hypersaline water that makes floating an easy thing to do. The black mud that is extracted from the lake serves therapeutic needs as well as cosmetic treatments – so a mud bath might be just the thing to rejuvenate a weary traveler. Masada was a former Jewish stronghold that refused surrender to the attacking armies of the Romans. They refused to surrender and committed suicide rather than live under the yolk of Roman tyranny. This was in 70 AD after the Second Temple was destroyed. You can take a cable car to the top of the mountain and see the food storeroom, the water supply system and Herod’s palace. Once you have made your way back down from Masada, be ready for a chance to take a dip in the Dead Sea – if weather and time permits – before a big, great tasting meal at our elegant hotel in Jerusalem. You’ll leave with a tear in your eye, and many, many great memories that will be able to relate to family and friends after you arrive home. This trip will just whet your appetite, and like most our travelers who fall in love with Israel, you will come back and book with us at IBMT Tours.